Dungeon Defenders is a 2010 video game developed by Trendy Entertainment that combines the genres of tower defense and action RPG. It is based on a showcase of the Unreal Engine named Dungeon Defense. The game takes place in a fantasy setting where players control the young apprentices of wizards and warriors and defend against hordes of monsters. 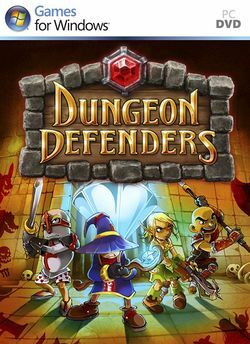 Dungeon Defenders was announced on August 25, 2010, and has been released on Xbox Live Arcade, PlayStation Network and Windows. Support for the Move accessory is planned for inclusion in the PlayStation 3 version. A PlayStation Vita version was planned but cancelled. First Wave is the obsolete mobile version of Dungeon Defenders, and was one of the first Unreal Engine 3 games available for iOS and the first available on Android, with a recent patch allowing cross-platform multiplayer gaming between the two mobile operating systems via GameSpy. Second Wave is the current mobile version of Dungeon Defenders. It is free on the Android Market, but paid on the App Store. It features a revamped menu system and improved controls. Original First Wave title screen. This page was last edited on 10 July 2016, at 00:26. This page has been accessed 11,201 times.